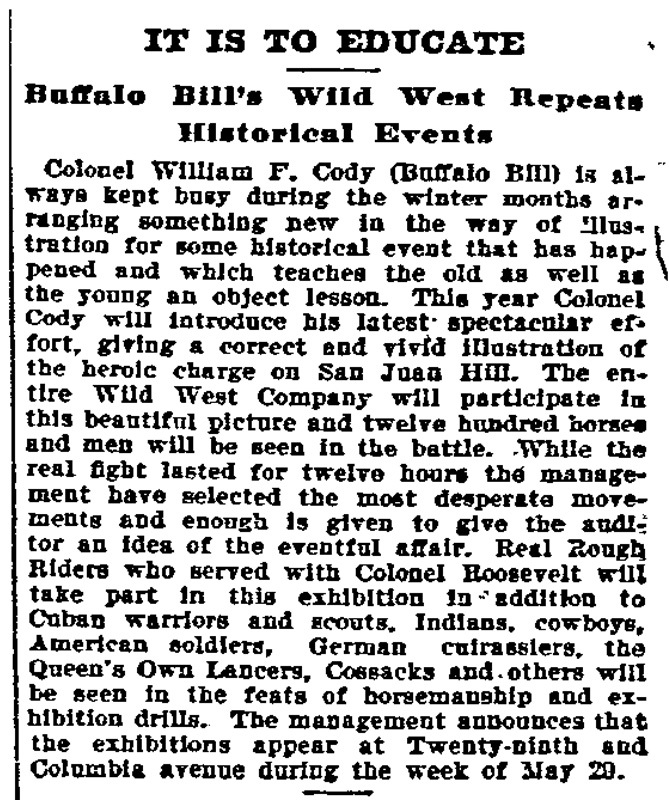 Colonel William F. Cody (Buffalo Bill) is always kept busy during the winter months arranging something new in the way of illustration for some historical event that has happened and which teaches the old as well as the young an object lesson. This year Colonel Cody will introduce his latest spectacular effort, giving a correct and vivid illustration of the heroic charge on San Juan Hill. The entire Wild West Company will participate in this beautiful picture and twelve hundred horses and men will be seen in the battle. While the real fight lasted for twelve hours the management have selected the most desperate movements and enough is given to give the auditor and idea of the eventful affair. 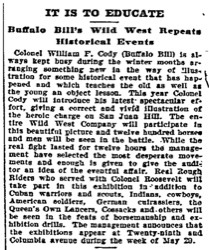 Real Rough Riders who served with Colonel Roosevelt will take part in this exhibition in addition to Cuban warriors and scouts. Indians, cowboys, American soldiers, German cuirassiers, the Queen's Own Lancers, Cossacks and others will be seen in the feats of horsemanship and exhibition drills. The management announces that the exhibitions appear at Twenty-ninth and Columbia avenue during the week of May 29. Keywords: American Indians Cavalry drill and tactics Cavalry horses Cossacks Cowboys Cubans Education Great Britain. Army. Queen's Lancers, 16th Historical reenactments Horsemanship Indians of North America Military men San Juan Hill, Battle of, Cuba, 1898 Scouts (Reconnaissance) Spanish-American War, 1898 Traveling exhibitions United States. Army. Volunteer Cavalry, 1st.